Use Bedside Table Carafes instead of plastic water bottles! Keep calm and drink water. I am trying to reduce my use of plastic water bottles for the sake of the environment. I like to have a bottle of water in bedrooms, and have not been able to figure out how to replace them. Somehow, my children’s old athletic water bottles just don’t create the look I’m going for. Old-fashioned bedside carafes are my solution. They are attractive and functional. I can fill them with filtered tap water and put one on each bedside table. I also put one on my desk. 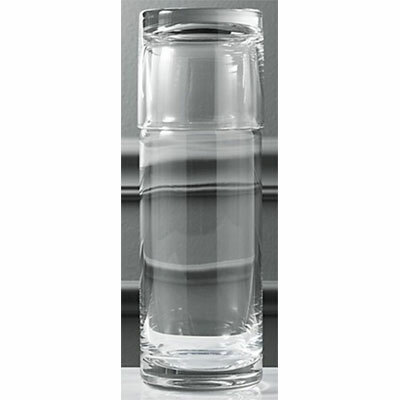 The Cora Carafe is a two-piece hand blown glass cylinder with the cup stacked on top. It doesn’t take up much room at 3.25” diameter x 10.25” high. $14.95. 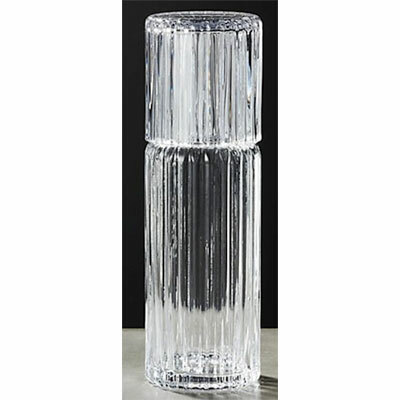 This is an old-fashioned retro ribbed glass carafe with the cup stacked on top. It is 3” diameter x 10.25” tall. $29.95. These Anna Karlin designed carafes come in fun colors with contrasting color glasses. They are made from hand-blown glass. The dimensions are 3” diameter x 8” high. $210 each. 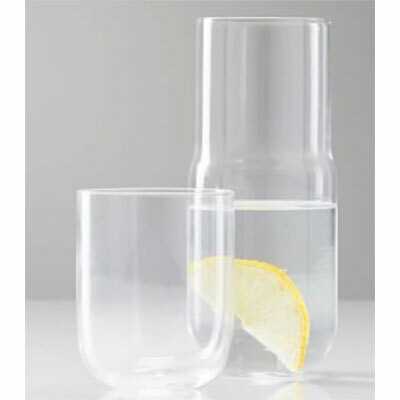 This clear glass carafe combines water pitcher and tumbler in a clean design. It holds 25 oz. and is 4” diameter x 8.4” high. It should be hand washed. On sale for $24.95. 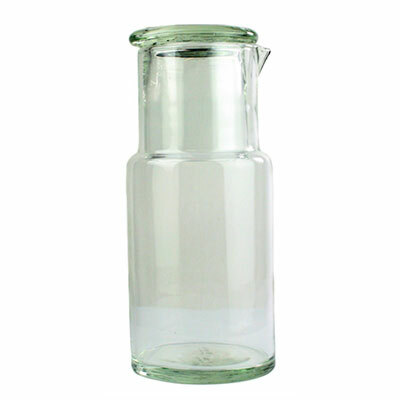 Add a subtle bit of color with this Homart green carafe. It holds 34 oz., and is 4.5” diameter x 8” high. It should be hand washed. It is $17.99. 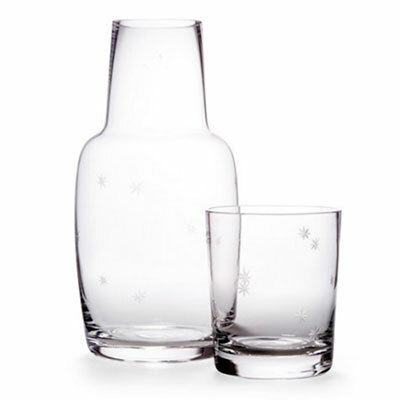 I like this Starburst clear glass carafe. The stars are etched into the glass. It is 4” in diameter 9” high and holds 32 oz. of water. It is made to order, and is dishwasher safe. $42.00. 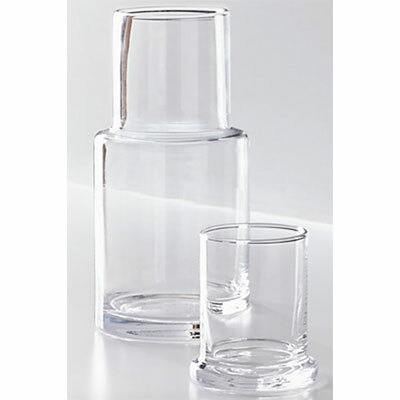 This is a hand blown clear glass carafe that has a weighted base for stability. It is 8.5” high and holds 26 oz. 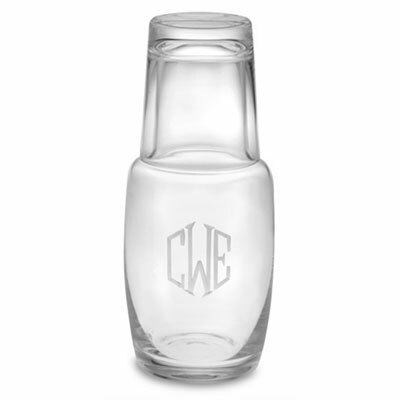 It can be monogrammed with up to 3 initials. It would make a great hostess gift! $31.96. See ASE’s article on serving carafes.